Apply Now! Deadline is January 10, 2018. Note: This is the only group scheduled for applicants for Fall 18. DANM’s two-year MFA program emphasizes collaborative interdisciplinary research that is innovative and socially engaged. 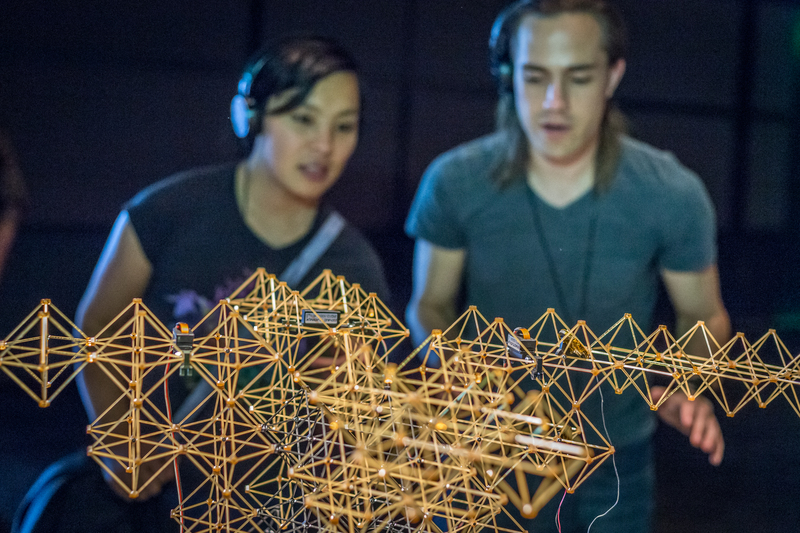 With close faculty mentorship, small clusters of students collaborate on artistic, technical, and theoretical projects. In addition, core and elective courses in the theory and practice of digital media arts support the development of individual thesis projects, premiered in our annual MFA Exhibition. DANM faculty are internationally recognized artists and scholars. Our Principal Faculty come from Art, Film and Digital Media, Music, History of Art and Visual Culture, Theater and Dance, Computational Media, and Art and Design: Games and Playable Media. Our Affiliate Faculty expand our expertise even further, offering students an unparalleled depth and breadth of mentors. DANM alumni teach at top research universities and art schools, pursue doctoral research, lead community-based organizations, work for major technology and entertainment firms, and have launched successful careers as exhibiting artists and entrepreneurs. The DANM alumni network offers our past and present students valuable professional opportunities and support. DANM is housed in the Digital Arts Research Center (DARC), a 25,000 ft2 building in the Arts Division quad, overlooking the Monterey Bay. DARC was designed by BCM, whose projects include Pixar Animation Studios and flagship Apple Stores in New York, Palo Alto, and Barcelona. The DANM Grad Lab is a large, open work-space that adjoins the Prototyping Lab. The Dark Lab is a 40’ x 40’ performance space with 30’ ceilings, Dolby 8.1 surround-sound, extensively wired for digital media and rigging. The Light Lab is a 25’ x 25’ multi-use space with 16’ ceilings. DANM students also have access to a variety of other studios, shops, and labs on campus. UCSC is nestled between the ancient redwood forests and the legendary surfing beaches of Santa Cruz. We are 45 minutes from Silicon Valley and just over an hour from San Francisco and the East Bay. DANM students may be offered up to two quarters of teaching assistantships which provide tuition remission, a stipend, and some fee remission. Explore the creative potentials and social implications of emerging technologies. Experiment with ideas, processes, collaborative research, and social action. Become a critical thinker, artistic innovator, and responsible leader.